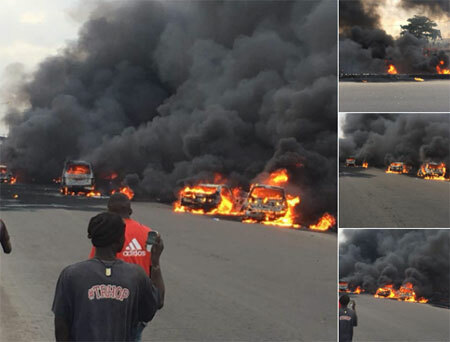 Lagos—The Lagos State Government said it has released at least three bodies out of the nine identified burnt beyond recognition in the Otedola tanker explosion to their families for burial. Earlier, Commissioner for Health, Dr. Jide Idris, at a press briefing in Ikeja, disclosed that the Deoxyribonucleic Acid, DNA forensic examination had been concluded, adding that the remains of the deceased would be released to their families for burial beginning from last Saturday. The DNA results came barely one month after the explosion that claimed no fewer than 12 lives, including nine that were burnt beyond recognition. Idris noted that it was the first time unidentifiable victims of a mass disaster had been successfully identified locally (in Nigeria) using DNA technology. He said the state government, through the Ministry of Health and the Lagos State DNA and Forensic Centre, completed the identification process in less than four weeks after the incident, against the over six months when the practice was to take samples abroad for analysis. He said the medical care of those injured was still ongoing at the expense of the state government, adding that in all, 10 patients were admitted at government and private hospitals, out of which two died, three discharged and five others still on admission. Confirming the release of the bodies, Chief Medical Director, LASUTH, Prof. Adewale Oke, said only three bodies had been claimed so far since commencement of the exercise. Oke also disclosed that all the bodies had been matched with their relatives and ready to be released to the identifiable relation with proper documentation. According to him, “All the bodies were deposited at the Mainland Hospital Mortuary, but relatives are meant to come to LASUTH first for proper identification to the rightful relative. We don’t just release the bodies to anybody. Speaking on the number of bodies left unclaimed, Oke said bodies were only nine and all have been matched with their relatives.